I still think about last year’s race as one of the best running memories of my life. It was that perfect race day you dream of where everything happened at the right moment, miles were executed, splits were on point and I finished that race exceeding my expectations. But what made it such a great day of running was how effortlessly those miles felt and how great I felt afterwards, enough to run a few miles in Vegas the next morning and hit the trails in the afternoon when we got back! Clearly, this year was not a repeat of last year’s as just getting from the hotel room to the car the next day was a painful feat in itself. I knew I had to run this race again and try for a sub 1:30 finish. Since I can’t predict who will show up on race day, the only thing I can do is train for a goal time, hopefully good enough for a top 3 finish. The Manhattan Beach 10k was a great base to kick off speedwork for this race. Instead of logging the same amount of miles I did last year (70-80 mpw since I was coming off Cuyamaca 100K and training for a 50 mile PR in January) I ran half the amount with more quality tempo runs on the road and trails, continued my interval training and pilates. The day started off much warmer than last year, I quickly ditched my long sleeve in favor of my InknBurn Bot Wire sports bra. We all walked towards the start line at Bootleg Canyon park and it reminded me of lining up for a trail race with the surroundings and low key vibe. …too fast. Definitely no negative splitting from the get-go. I really hate looking at my watch because it tends to get obsessive and stressful for me when I’m more focused on pace than feel. I knew the pace was fast, I just had no idea it was that fast. My heart was racing and beating out of my chest and I had to keep telling myself to calm down and settle in because there was no way I would be able to keep up this pace for another 10 miles. The pace was uncomfortable in a bad way as I tried to keep Matt in sight before my legs finally gave up. We descended from Bootleg Canyon Park on paved bike trails for the first 6 miles before hitting the trail portion of the course. I was also running scared of how many women were right on my tail. Instead of focusing on my breath and strides, I bumped my music louder to drown out all the surrounding sounds of footsteps around me. There was a hill around Mile 3.5 which left me feeling beat and exhausted by the time I crested trying to keep pace. Soon after, a women flew by me. I quickly glanced at my watch and saw that I was holding onto a 6:30 pace and she just breezed right by me. I let her go knowing even holding onto 6:30’s for the rest of the race would be tough, especially on the trail portion. Even though I was finally settling into my goal pace, I was only 4 miles into the race and I already felt defeated. My quads were tight, my legs felt heavy and my mind was foggy. 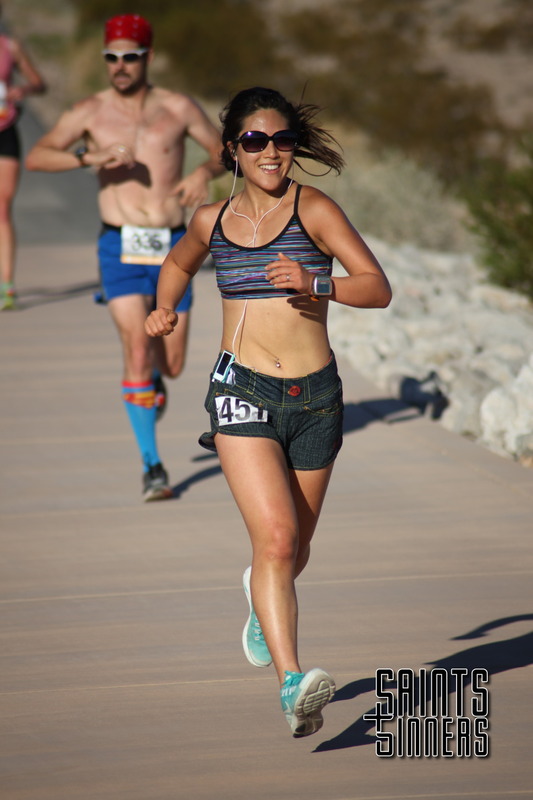 My mind was occupied by last year’s race as I replayed those exact same miles over and over again and how good I felt cruising behind the lead woman. All these negative thoughts flooded my head, as I cursed myself for not having run enough leading up to this race. My friends Eman and Dave caught up to me and pulled ahead as I fell more and more behind. Another woman passed and as hard as I tried to keep up with her, I felt myself falling behind her strides and watched as she got smaller in the distance. I couldn’t wait to hit the trail after Mile 6 and pick things up just like last year. 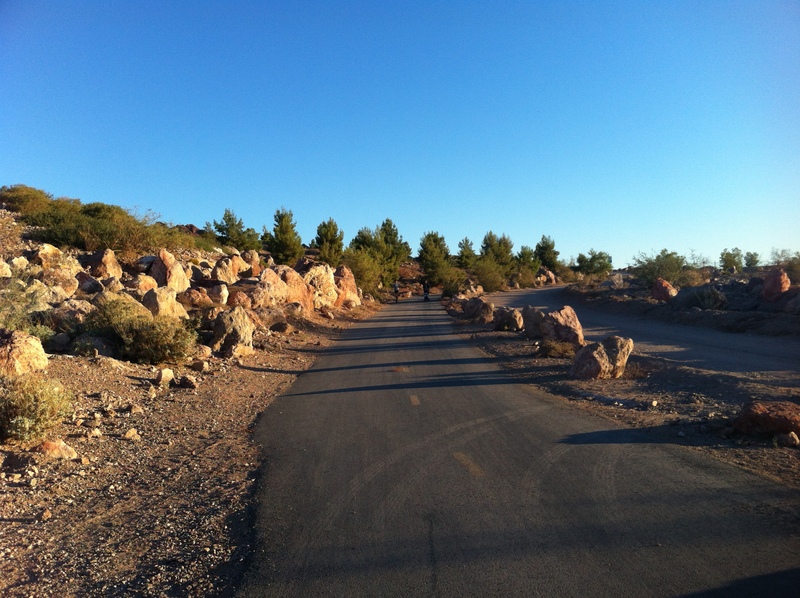 We had 4.4 miles of trails following Lake Mead’s Historic Railroad Tunnel on the mountainside above the lake. 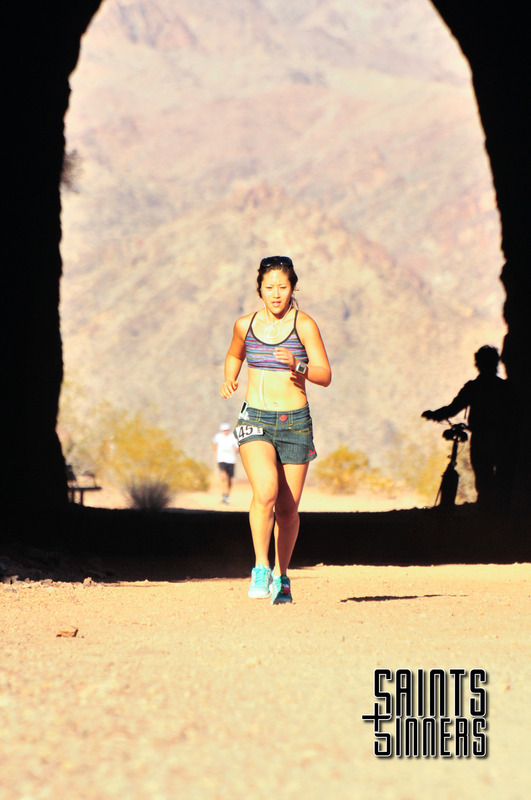 The trail included a series of five tunnels (a few hundred feet long) which were once part of a railroad used to construct nearby Hoover Dam. Unfortunately, once my feet hit the trail, I knew immediately this wasn’t going to be a repeat of last year. My legs felt like bricks and it felt like I was running 10 min/miles. I didn’t dare look at my watch because I knew I was going slow. I said goodbye to a PR and silently waited for the next female to catch up. 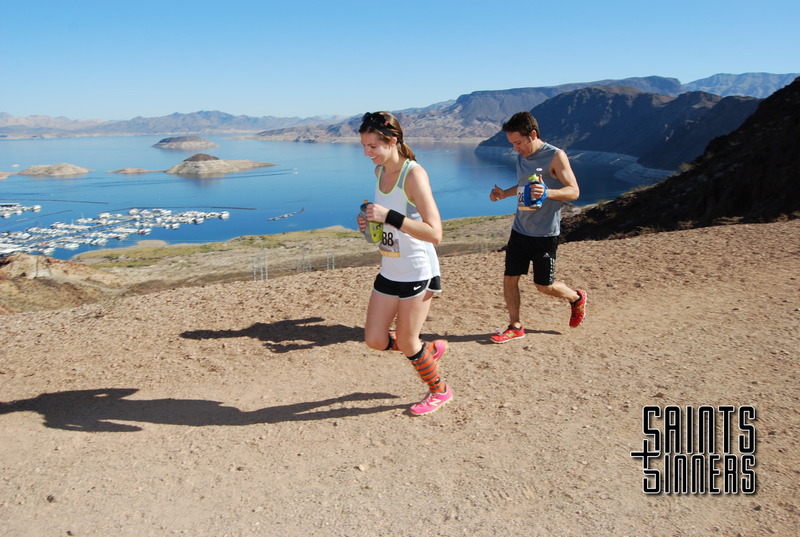 Last year I had such a blast on the trail portion, taking in the incredible views of Lake Mead while winding in and out of railroad tunnels. Running blind through the darkness to submerge into the light on the other side, cheering on the other runners as they ran back from the turnaround. The rocky terrain on the trails didn’t help, only aggravating my injured foot even more. I slogged my way through those miles, looking forward to the turn around and seeing my friends. I saw Matt before the turn around, holding onto 5th overall and telling him how great he looked. He yelled at me to catch the two women in front of me and I just shook my head and said I couldn’t do it. As I approached the turn-around, I saw that the 2 women were in fact not all that far ahead of me and gave me the tiniest glimmer of hope. By some turn of luck (maybe the swig of crack Gatorade?) my legs started picking up speed again after the turn-around and I found myself having fun. The soreness in my quads subsided, the cramps went away and I focused on chasing down every runner in front of me. With every runner I passed, I felt my brain clearing up from the fog. I was in a totally different state of mind on the way back, it was so much fun to see all my friends and I couldn’t wait to get back on the pavement where I could finally pound out the last few miles. Once through the tunnels, we joined the River Mountain Loop Trail and descended down to the beach. 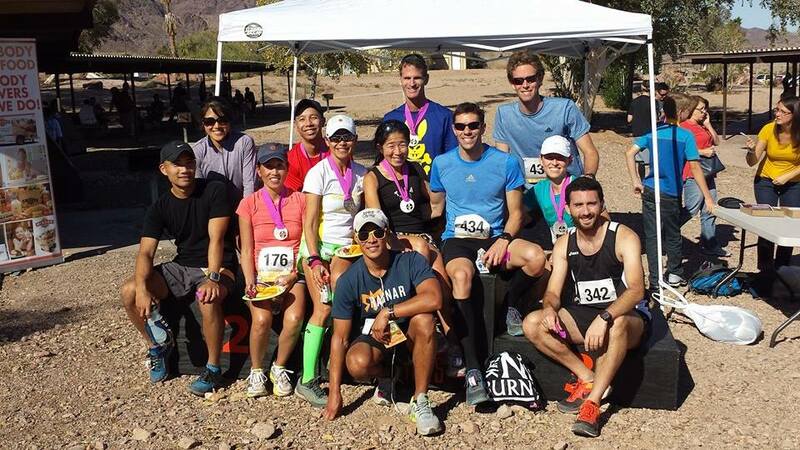 At one of the final aid stations, I saw that the 2nd place woman was not that far ahead. It was still far enough where I was content with settling for third if I was able to keep my current pace for the last few miles. I took more Gatorade as that seemed to have a huge affect on my energy at the last aid and turned down my music so I could really focus. I felt each stride get faster and before I knew it, I was closing in behind her. I contemplated whether or not I should pass, afraid I would embarrass myself if I wasn’t able to keep pace and have her pass me again, but I made the call to pass as it might have been my only chance. I ran scared, just like I did for the last 6 miles of the race last year, listening to any footsteps behind me, getting paranoid when I would feel a weird twinge in my legs. 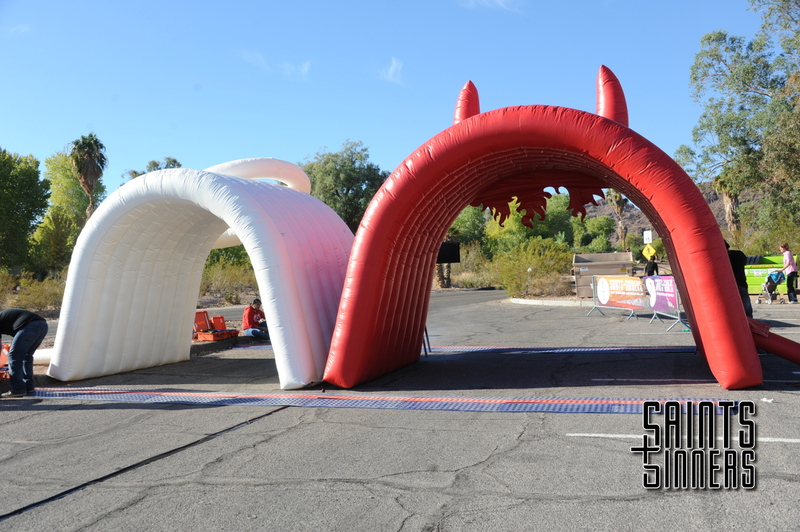 I knew the finish line was close when I could see the RVs at Lake Mead Park by the beach. I really had no idea what my finishing time would be since I hadn’t looked at my watch the entire race, so when I saw 1:29:02 I was shocked. I was 99% sure my time would be over 1:30 just based on how much worse I felt this year. This was such a tough day for me, but proves that all is not lost and you CAN turn a race around if you really wanted to. It did not feel as great as last year and I struggled a lot during those middle miles, but I pulled myself back together to finish. It was a fun day racing and watching all my friends do so well and hit their personal bests. 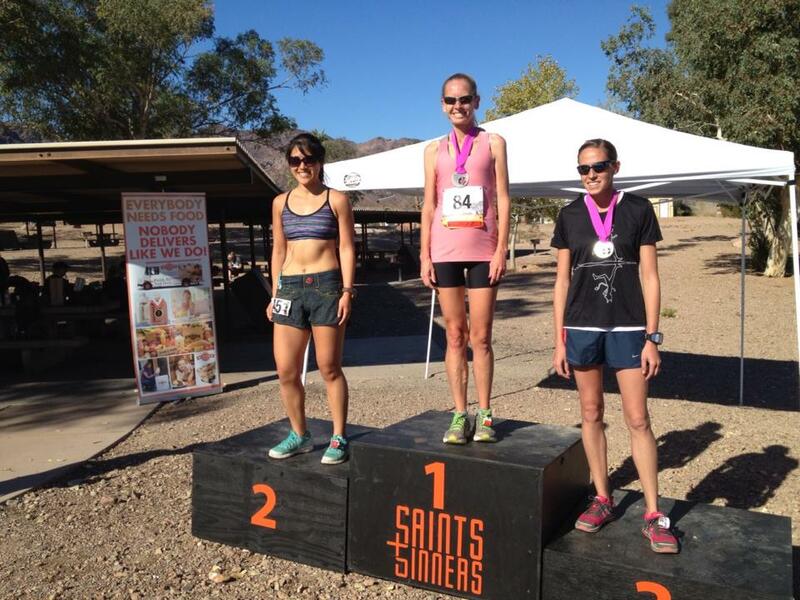 Thanks Saints and Sinners for another great race! 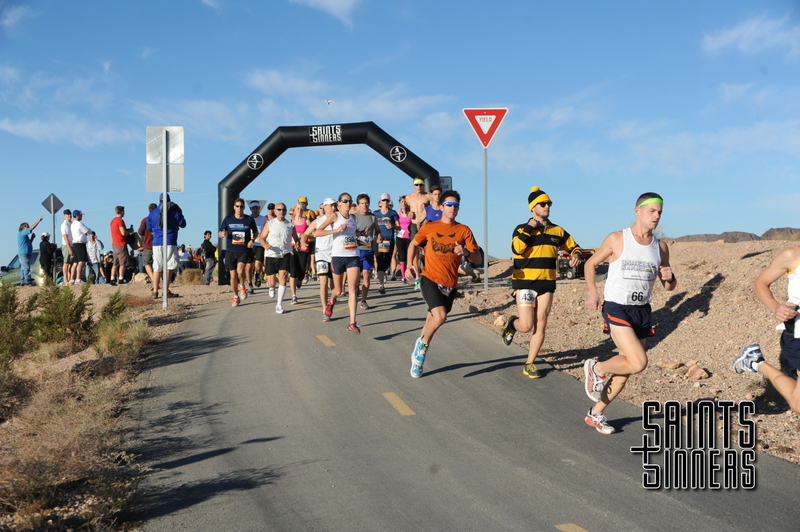 By the way, all the race photos they took are free digital downloads! How awesome is that? Hope to come back again next year.